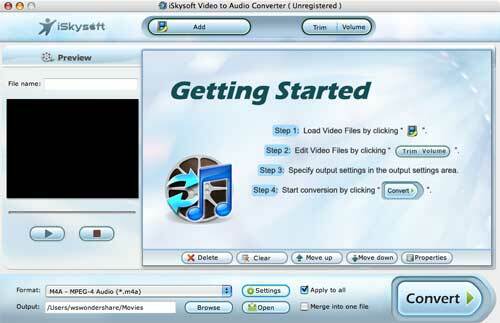 iskysoft Video to Audio Converter for Mac can convert the audio track for your video files to popular audio formats. It can convert MPEG to MP3 and RM to MP3, and so on. This Mac Video to Audio Converter provides you with very useful features such as batch conversion, trim audio, and merging added files into one file. Convert your video audio to all sorts of audio formats for your audio players with iskysoft Video to Audio Converter for Mac! *Convert all popular video formats to MP3, WAV, AAC, AC3, OGG, APE, M4A, etc for your MP3 players. You can import the extracted audio to audio editing software to create your own masterpiece. *Extract from RM to MP3, from MPEG to MP3 and from lots of other video formats to audio. *Convert the audio of selected videos into one output file. *Note: This video to audio converter won't bring any damage to original videos. *Trim any part of the video to get the audio clips you need and you can just trim your favorite segments and convert them to MP3 audio as ringtones for your phone. *Support audio output settings, including sample rate, channel, encoder and bit rate. Qweas is providing links to iskysoft Video to Audio Converter for Mac 1.9.6 as a courtesy, and makes no representations regarding iskysoft Video to Audio Converter for Mac or any other applications or any information related thereto. Any questions, complaints or claims regarding this application iskysoft Video to Audio Converter for Mac 1.9.6 must be directed to the appropriate software vendor. You may click the publisher link of iskysoft Video to Audio Converter for Mac on the top of this page to get more details about the vendor.